LeBron is amazing to watch. Even when he’s killing my team I can’t help but marvel at how good a basketball player he is. His shooting is better, his passes are on point, and his defense is intimidating. But it’s how smart he is, how aware, that sets him apart from his peers. First, he understands what makes the Dubs tick. The Warriors get killed when they start cold from the field. Much of this is their inability to hit shots but the way the Cavs have capitalized on Golden State’s cold shooting is driven by LeBron in transition. The Warriors offense is physically taxing and when the offense ends in a missed three, LeBron is grabbing that board and flying at the backpedaling Dubs. This gets the Dubs in early foul trouble and keeps their vaunted defense from ever getting comfortable. The Dubs can solve this by making shots but it’s hard to make shots when you’re forced to deal with LeBron and the Cavs playing downhill. LeBron has been attacking in a smart and efficient manner to capitalize off Golden State’s cold shooting. Second, he makes backbreaking shots AND passes. The Warriors can live with forcing LeBron to make contested shots. However, what really kills them is when they place solid defense for 18 seconds and then LeBron throws a bullet or lob that is perfectly timed and aimed to JR Smith for a three, or Tristan Thompson for a dunk. These are not easy reads, they just look it because LeBron is the best passer since Magic Johnson. Three from downtown, LeBron is hitting his jumper. He’s shot 50% from three in the last two games and when his shot is on, he is legitimately unstoppable. Iguodola is hobbled but even a healthy Iguodola can’t deal with a jumpshot-hitting LBJ. That frees up driving lanes. And with a player who gets confidence when he sees things work, Draymond’s inability play in game 5 is looking even more brutal because he has rediscovered his confidence in the paint. The Warriors had been living inside of LeBron’s head when he would attack the basket and that showed in the missed dinkers and dumpers that he accumulated while playing the Dubs over the last two years. It looks like he’s figured that out. Small ball fourth, Draymond Green may have pioneered the small ball 5 position with his defensive and offensive versatility but LeBron is certainly making the case that he is a much better small ball 4.5 player. LeBron is quite clearly a better offensive player than Green and while Thompson is the center for the Cavs on offense, LeBron has been playing the rim protector role perfectly. Imagine if Green were bigger, faster, and more athletic. Green may be a better post defender but LeBron has been killing it as the Cavs’ last line of defense. The Warriors have leveraged the threat of the three point shot all season to create easy looks at the basket – they normally shoot very well in the restricted area and get great looks based off of their spacing and ball movement. It’s how they were winning the series through the first four games. LeBron’s commitment to playing defense at the rim has taken away all those easy looks. Now the Warriors must rely on strong 3-point shooting, as opposed to using it as a threat to create easier buckets. It makes those open misses all the more painful. Finally, he’s controlled the pace of the game completely. As I mentioned earlier, he uses Golden State misses to attack them in transition. But when the Dubs go on a run, he also switches back to a slower pace and forces the Warriors to defend for longer possession. And unlike last year, he’s doing it by creating out of the pick and roll. While he is an effective post player, the Warriors are better tailored to counter LeBron’s post game due to their length and quick rotations. By forcing Curry or the center on the floor in the pick and roll, he’s done a better job capitalizing off of the Warriors switch happy defense. He has also been attacking earlier in the possession as opposed to winding down the clock so the Warriors have to be wary of sending help. Send it too early and LeBron finds someone else for a backbreaking bucket with two ticks left on the shot clock. Send it too late and he drives past the center switch or backs down the smaller Curry. He’s controlling all the possessions and has only committed three turnovers. The lack of live ball turnovers keeps the Warriors from getting the easy buckets in transition they’ve feasted upon against other, more undisciplined teams. That’s the luxury of having the best player in the world. Even more so than with other sports, one player can have a tremendous swing on the outcome of the game due to the relatively small-sized teams and the non-stop flow from offense to defense. Golden State has the better team overall, but LeBron has been head and shoulders above anyone else on the floor these last two games and that has been the difference. The Warriors should be confident going into the game 7 but the Cavs have the momentum. LeBron is playing the best ball of his career and it should not go unrecognized the incredible effort he has had to put forth to play this team. For everything he’s doing well, the Warriors are also shooting themselves in the foot with poor focus and an inability to make shots. But that’s part of who they are. If LeBron is the best player because of his ability to control games, the Warriors have proven they’re the best team by leveraging the creativity of their superstar and playing some periodically dangerous risk vs reward offense. The problem is that LeBron’s surgical precision on offense has frayed at the Warriors’ defensive identity. This puts more pressure on their offense to score which has clearly gotten into the Warriors’ psyche. I have no prediction for who wins Sunday. I predict that regardless of the outcome, LeBron is Finals MVP. If the Warriors start the game hitting shots, that changes the complexion of the game because it will loosen them up. But their failures from outside in game 5 may come back to haunt them. Oracle is a strong home crowd but it tends to get nervous very fast. If the crowd is angry that will really pump up the energy of the Dubs, who are pissed at themselves, the refs, and the league. But if they start slow again, the crowd energy becomes very tense and that’s when the Warriors make poor decisions and fling up three point shots outside of the offensive flow. Disciplined teams have capitalized on the crowd’s wariness during this playoff run and with LeBron’s intelligence, you can be sure he’ll be looking for the killshot early and often. As a Warriors fan this makes me miserable but as an NBA fan, I could not ask for more from this season. The narratives for both teams are huge and it wouldn’t be surprising to see them battling it out for NBA supremacy over the course of the next few years. They have both scored 610 point exactly through this stage in the Finals with momentum swinging towards Cleveland. 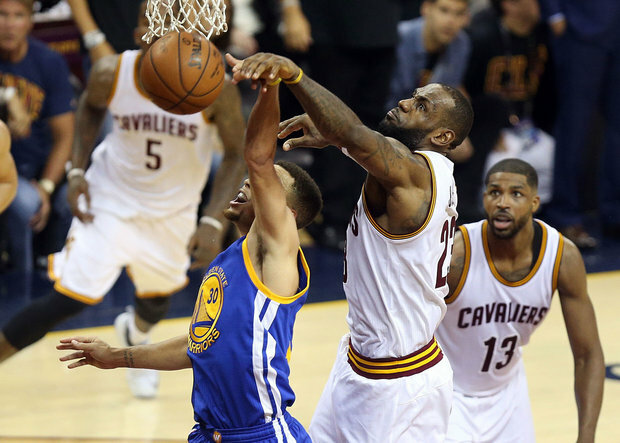 This is LeBron’s shot – the Warriors have never looked this vulnerable. They’re physically and mentally shot from their title defense and having to survive the Western Conference. The Cavs can sense the blood in the water and they’re looking far more fresh after they strolled through the East. If they don’t capitalize, this chance might not come around again. If the Warriors win, the mountains they’ve climbed to claim this victory can no longer be ignored. Injuries, the pressure of greatness, and untimely suspensions have forced them to dig deep and gut out every win. They just need one more to make history. Lose and they’ll forever be known as an opportunistic team that couldn’t hang with the harsh climate of “real” playoff basketball. And years of retired players crapping on their hollow 73-9 season (God, I’m getting nauseous just thinking about it). My favorite question: can LeBron’s individual brilliance continue to overcome the collective excellence of the Warriors? What better way to learn the answer than through a game 7.